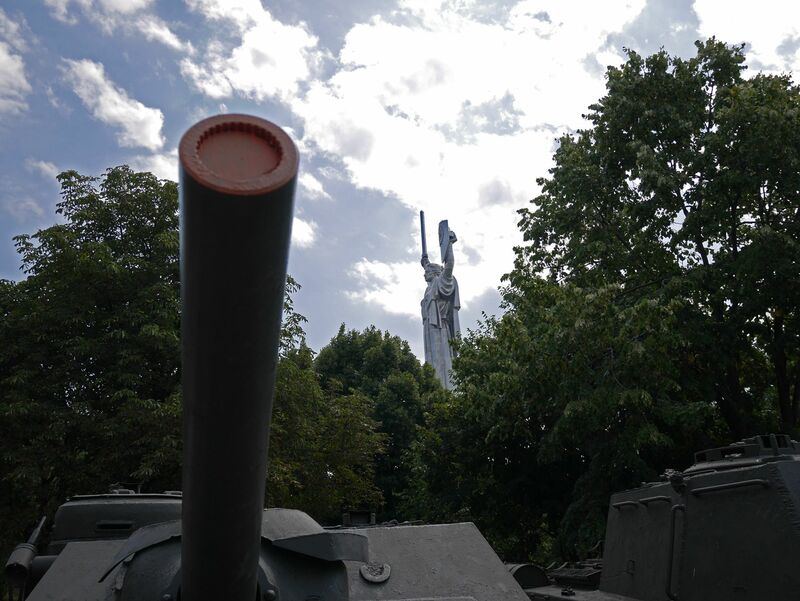 Ukraine’s capital has many sights, but few can beat the Rodina Mat, Mother Motherland statue on a sunny day. The Motherland Monument can be seen from many parts of Kiev, and if you dare, you can go all the way to the top, 102 meters above the ground. We are in the outskirts of Kiev, close to the old parts of town and above many suburbs. Kiev is a city with lots of hills which also means great views. 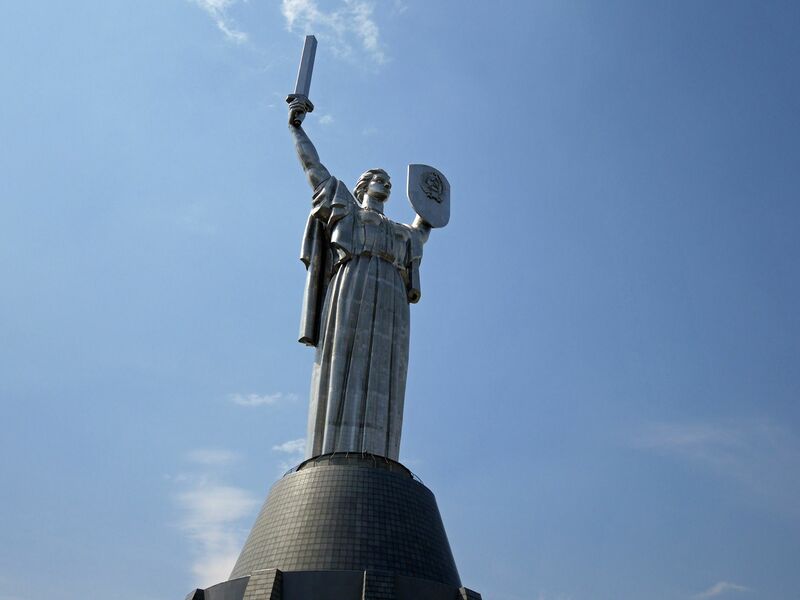 The Mother Motherland Monument (UA: Батьківщина-Мати, RU: Родина-мать) opened in 9th May in 1981 and made of stainless steel, inspired from a plan back in the 1950s and placed in Pechersk in Kiev. The main guest at the day of inauguration was the Soviet General Secretary Leonid Brezhnev. The, in Ukraine, controversial shield with the hammer and sickle. The total height is 102 meters including the elevation on the ground the structure is standing on. The total weight of the structure is 560 tons. There is a sword in the statue’s right hand that measures 16 meters and weight 9 tons. 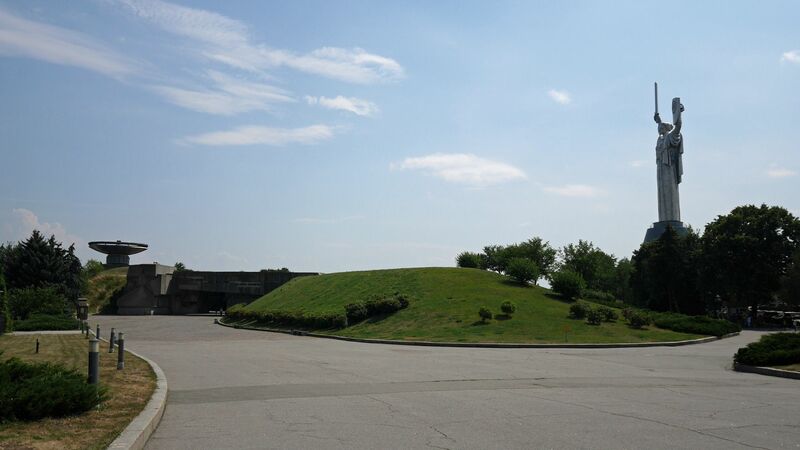 The shield in the left hand has the dimensions of 13×8 meters. Designers are Yevgeny Vuchetich and Vasyl Borodai. In the ground level is a museum about the history of Ukraine during World War 2. Nowadays, also a smaller exhibition about the ongoing conflict in Eastern Ukraine is shown. From the ground, the upper parts of the statue can be reached by elevator. Opening hours are Monday to Friday from 10 AM to 18 PM and Saturday to Sunday 10 AM to 19 PM. The Mother Motherland Monument can easily be reached from the metro station Arsenalna and walk the last way by foot following the signs to “Slavny” (Eng. Eternal Glory). This walk will take around 30 minutes (2,5 km) and you will pass other great buildings like the Caves Monastery. Tired legs can use trolleybus #38 or bus #24 from Arsenalna. Go 4 stops along Mazepy Street. Mother Motherland as a symbol – For what? Maybe you already have noticed the hammer and the sickle on the shield? Is the monument a symbol of communism? 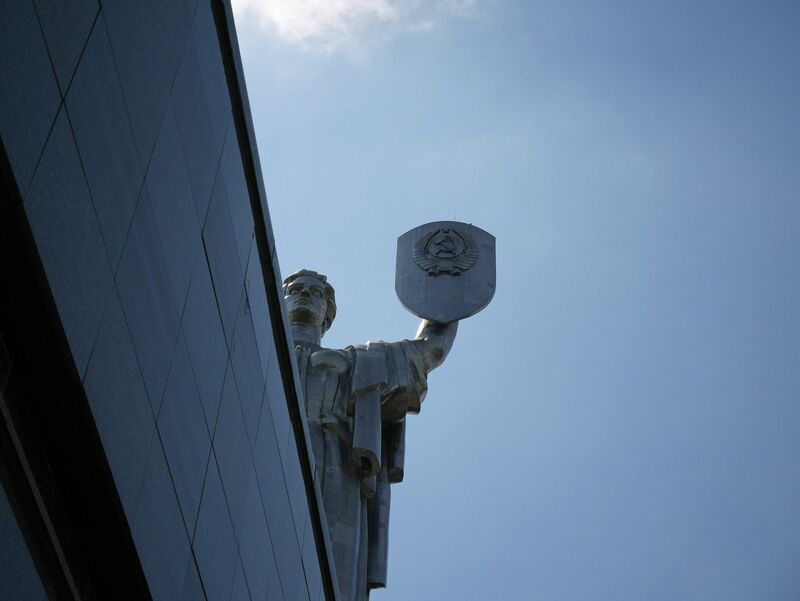 The Motherland statue is not a symbol of communism but was built during the communist era. The monument was also planed in an era where victory monuments of World War 2 (see the one in Minsk here) were very popular to build. That why the opening took place on the 9th of May which is a day of big celebrations in Eastern Europe and is also called Victory Day. The first draft showed that the monument was planned to be 200 meters high. Instead, but in the end, we got half of it, but on a hill. The feeling is still that the monument feels higher than it really is. And it’s a classic illusion that you can find in many Soviet buildings and monuments where they give a feeling of that the regular human, is small and not have a possibility to change anything. Now we know things changed at the end of the 1980s anyway, but you can still feel this when you walking in places with a lot of Soviet architecture – You are just alone and powerless and these building and what the symbolize will stand forever no matter what you think. So, Victory Day is still celebrated widely in former Soviet states, and they still feel involved in the victory, but not in the Soviet Union – and therefore, these Soviet monuments still can be seen everywhere. In 1979, when the monument was started to be built, the costs of the construction was controversial. Today, Mother Motherland is more controversial than ever. In the year 2015, the Ukrainian parliament criminalized Soviet and Communist symbols, as well as street names and monuments. And due to a serious shortage of money for maintenance, this made a great threat towards Rodina Mat. Even if statues of Lenin have been torn down in most of the Ukrainian cities, the Motherland monument is still intact and the hammer and the sickle can still be seen. About Ukraine’s bad economy, the flame close the monument is only lit on the biggest national holidays. That’s because the gas consumption of the flame is calculated to 400 cubic meters per hour. Also, the large amount of steel inside the monument has been a subject of discussion. The monument to the right, the gas consumptioning flame to the left. 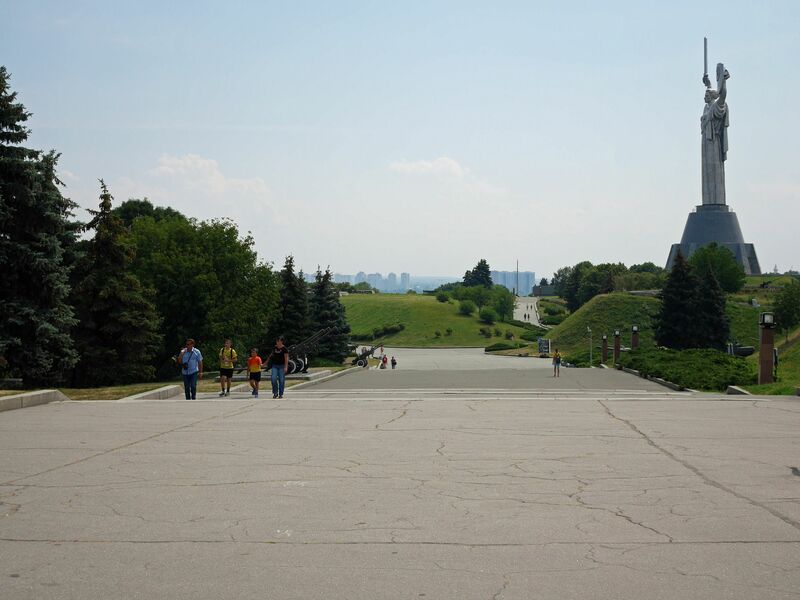 But, still, the monument and the surrounding park is a popular place for the inhabitants av Kiev. And don’t forget the large crowds of tourists that go here. It is good that hammer and sickle survived last years, the monument looks impressive!